Happy St. Patrick’s Day! I am hoping you made something naturally green this morning, like these Green Muffins or Green Pancakes, and rejected green-dyed bagels. A green juice would be rather appropriate today, as well. Now let’s move on. 😉 Not only is it St. Patrick’s Day, but it is also a mere few days before the first day of spring, a day of rebirth and nature’s way of starting fresh. When spring rolls around, all I want is anything fresh, green and herbaceous. Herbs are nature’s detoxifiers and the perfect way to cleanse the body. I add herbs to everything from smoothies to salads to different pestos to grains. 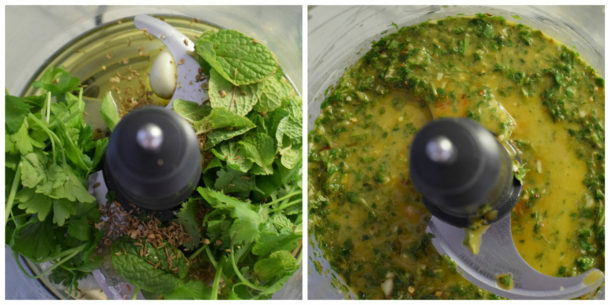 Chermoula (spelled slightly different ways) is like a Moroccan pesto, just without the dairy and nuts. It’s an herby condiment with a little acidity, garlic and some earthy spices. I add a pinch of crushed red pepper, but it’s not spicy. I absolutely love it and its versatility. I taught chermoula in a class last year over roasted wild halibut, but I couldn’t wait to slather the leftovers over eggs, roasted vegetables and stirred into warm grains like rice and quinoa. Chermoula is a HUGE flavor booster! It’s really easy to make provided you have your herbs washed and dried. And you can certainly make chermoula a day or two ahead of time and keep it refrigerated. 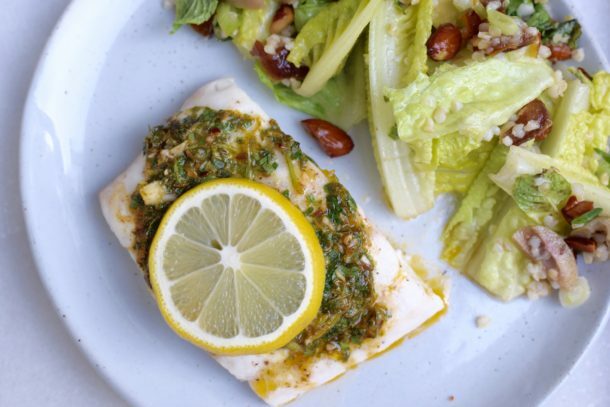 This recipe calls for chermoula on top of a wild Alaskan halibut, a very mild fish that benefits from some punch! It is such a perfect light meal when paired with a green salad with a smattering of cooked whole grains. But you can enjoy the mixture over chicken or steak, as well. I had a vegetarian group which I accommodated with the chermoula over cauliflower steaks. Delicious! When I was growing up, we ate fish on Fridays during Lent and most Fridays during the year, as well. So I thought it was a fitting time to share this recipe. (I am using frozen/defrosted wild Alaskan halibut from either Vital Choice or Costco in the off-season.) Don’t be stressed about cooking fish. It’s very easy, but it cooks quickly so people tend to overcook it. If you’re cooking halibut at 400 degrees, plan for 10 minutes for a piece of fish 1-inch thick. Stick the tip of a paring knife into the fish and wiggle it. If the layers of the fish start to separate, that’s “flaking” and the fish is cooked properly. 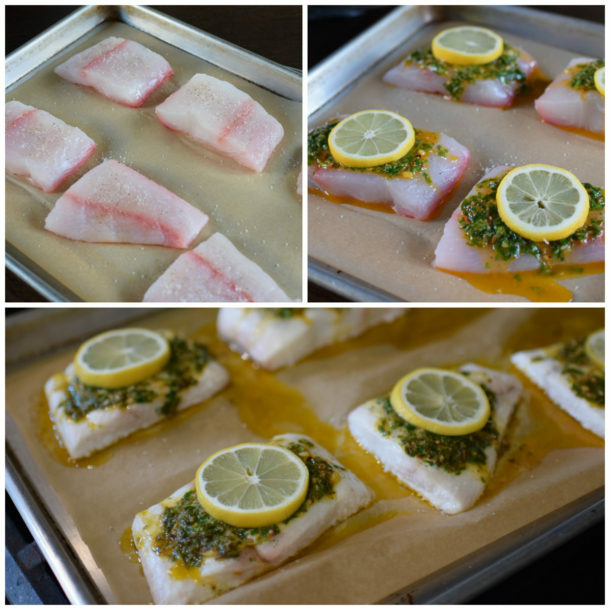 Fish does continue to cook if it sits on a hot sheet pan out of the oven, so plan accordingly be prepared to serve it right away. This would also be great for Passover if you’re looking for an alternative to brisket. Now that I turned in my final edits on my book (!!! ), I can start planning for Passover. Stay tuned! Preheat the oven to 400 degrees and line a rimmed baking sheet with unbleached parchment paper. 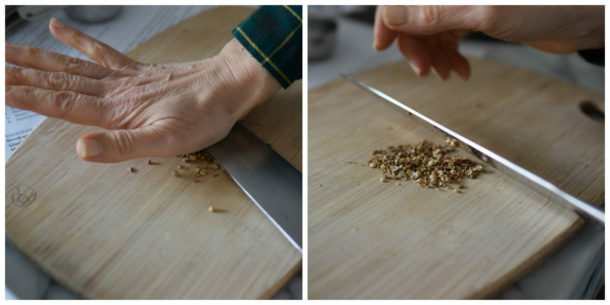 To make the chermoula: toast the cumin and coriander in a dry skillet until fragrant, stirring occasionally, about 2 minutes. Set aside to cool, then crun=sh with the flat side of a knife or a heavy skillet. Add to the bowl of a food processor fitted with the metal blade. Add the remaining chermoula ingredients to the food processor and pulse until mixture is desired consistency, either very smooth or somewhat chunky. Arrange the fish on the prepared baking sheet, drizzle with a little olive oil and sprinkle with salt and pepper. Spread a spoonful of the chermoula onto each piece of fish and top with a lemon slice. Roast the fish for 8-10 minutes, depending on the thickness of the fish, about 10 minutes for 1-inch thickness. You will know the fish is done when it is opaque and can be flaked with a fork. Serve immediately. If toasting spices is too fussy for you, don't do it. Just add ⅛ teaspoon of each ground spice into the food processor. It tastes 10 times better with freshly toasted spices, but it's still great with ground. I finally made this tonight – fantastic! I forgot to write “seeds” on my spice list so I used the regular. I cannot wait to try it again *with seeds*. I actually turned it into a cauli-rice bowl with a ton of sautéed vegetables, chard, and avocado. 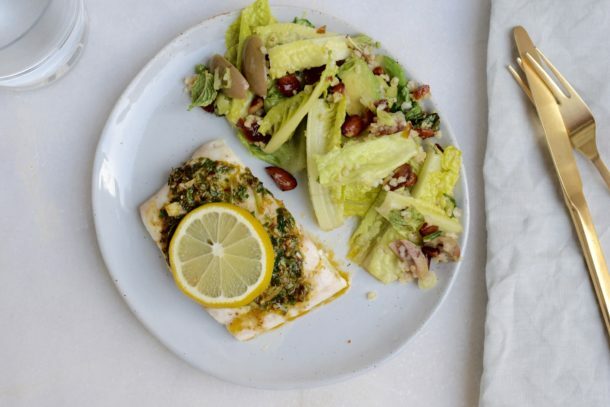 What is the salad you are serving with the chermoula fish? It’s my Marakkesh Salad which I haven’t posted yet. It’s AMAZING! I am making the fish for a dinner party. What salad from your posted recipes would you suggest? Thanks they all sound wonderful. I will go with the green salad and your #2 dressing which I have used before. Have a great holiday. Thank you so much for posting this!! I have been searching for this recipe for more than a year. I had it years ago and it was delicious, but I failed to get the name of it. Can’t wait to try it!! Cool! You can also change it up if you like it minty or spicy, etc.